Nine years ago, I received a lot of mail when the doujin circle Fuguriya announced A Kiss For The Petals. No hermaphrodites or gender transformations (such as male protagonists becoming female). With those tenets laid out, we had a clear view of our goal to create a dirty, yuri, romantic comedy. Basically that means there are a lot of things you have to avoid, even more than if you were making a traditional (male/female) “pure love” type of game. …Or more like, there’s a high probability of ticking off yuri game fans if you make something that ignores those tenets (*sweat*). Check back next week for Vol. 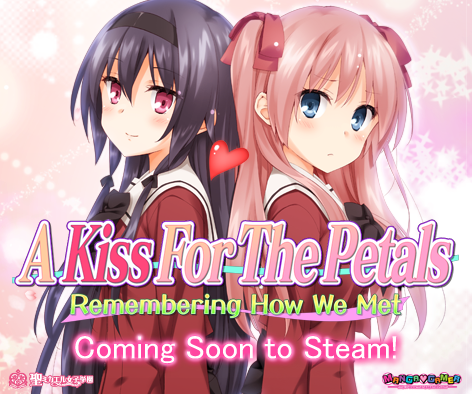 2 in which Mi Kara Deta Saba discusses the challenges of producing art for the A Kiss For The Petals series!